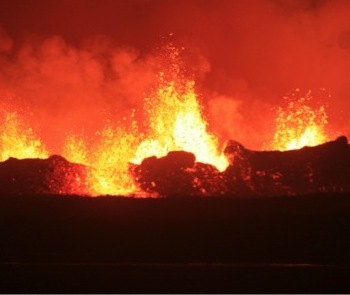 We arrived at the eruption site around midnight on 1st September. My team and I were part of just a handful of people allowed into the 10,000 square kilometre exclusion zone – a black volcanic desert 2,000 feet high. The darkness of the night was uninterrupted by any human lights, and we knew there was no-one else within at least 100 kilometres of us in any direction. Over the next few days we continued to return to the site, on two occasions rescuing our seismometers only a few tens of metres from the approaching lava. The molten rock progressed unstoppably across the gravelly plain. Not even a river could halt its flow – it just boiled the water and moved on, progressing a thousand metres or more every day. The eruption was awesome in the proper sense of the word. As a Christian believer, this demonstration of the raw power and beauty of God’s creation resonated deeply with the Bible’s description of God as powerful and sovereign over his creation. It’s a creation in which God takes huge pleasure, and which he pronounced as being ‘very good’. In contrast, humans cannot even begin to slow the eruption or even to divert the flow of lava. Everyone who witnessed what happened in that lonely place in the middle of Iceland, far from any human constructs, was awe-struck. It seems to me that it is part of God’s grace in making us in his image, able to relate to him in a personal way, that we humans can all feel the visceral power and pleasure in such natural processes. Everyone can experience that, whether or not they acknowledge God as the ultimate creator. I know it was a huge privilege to be there, yet the same sense of closeness to God’s creation can come at almost any time. Often it pops up unexpectedly in the course of our everyday lives: in the stillness of mist hanging low over a meadow or a street in the early morning; in the sudden trill of a bird in the midst of a city; in the beauty of a single flower that catches our attention; in the flutter of a butterfly’s wings; in the crash and tumble of waves on a stormy coast; in the silence of a starry night. What a great reminder these are of the presence of a living, loving God and of the hope we have of an ultimately renewed creation as we live out our lives in the midst of an often confused and struggling world. TV interview (approx. 8 mins in). This piece has been shared with the Care of Creation blog, Our Father’s World.